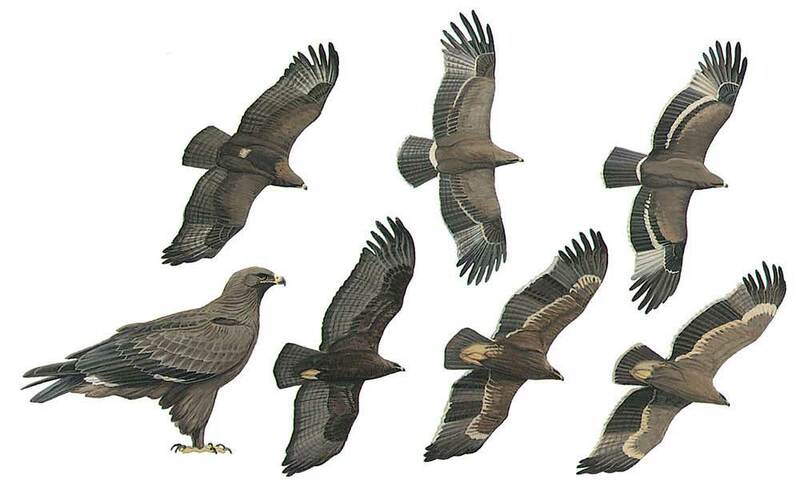 Dark brown adult has variably coloured underwing-coverts, either similar to body or paler; underwing uniform, or with paler or darker flight-feathers with well spaced broad dark bars and clear-cut band on trailing edge (pattern sometimes diffuse); large dark carpal-patch typical, except in darkest birds. From above, coverts often palest part of wing; usually large, dark-barred, pale primary-patch; grey-brown tail often boldly barred with broader dark band at tip (absent in spotted eagles). Juvenile pale brown with diagnostic broad white band through middle of underwing, from above, large primary-patch and dark rump separates it from most young Imperials. Subadult usually has darker body than underwing-coverts, a white underwing-band and well spaced flight-feather barring, long deeply fingered wings, ample hand (long 4th primary) and long, heavy bill. Flight heavy; often soars on flexed, flattish wings but can soar and particularly glide on arched wings with lowered hand. When perched, large heavy ‘trousers’ unlike the spotted eagles; long yellow gape flange to rear-end of eye, separates it from other eagles.